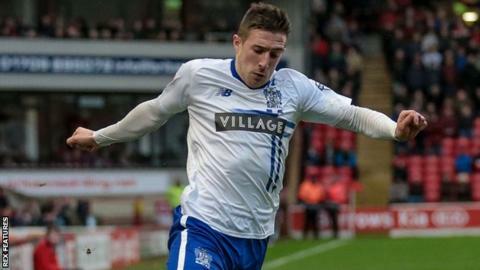 Bury registered their first league victory in four games with a win over Sheffield United at Gigg Lane. Ryan Lowe twice went close for the home side as they dominated the opening stages of the game. Full-back Craig Jones gave the Shakers the lead with a curling strike from 20 yards out. Joe Riley denied the Blades after the break with a fine clearance off the line before a last-ditch block denied John Brayford a late equaliser. Match ends, Bury 1, Sheffield United 0. Second Half ends, Bury 1, Sheffield United 0. Corner, Sheffield United. Conceded by Joe Riley. Corner, Bury. Conceded by Jay McEveley. Substitution, Bury. Tom Pope replaces Ryan Lowe. Attempt saved. Leon Clarke (Bury) left footed shot from the left side of the box is saved in the bottom right corner. David Edgar (Sheffield United) is shown the yellow card for a bad foul. Danny Mayor (Bury) wins a free kick in the attacking half. Corner, Sheffield United. Conceded by Nathan Cameron. Foul by Chris Basham (Sheffield United). Ryan Lowe (Bury) wins a free kick in the attacking half. Substitution, Sheffield United. Matt Done replaces Jamal Campbell-Ryce. Jose Baxter (Sheffield United) wins a free kick in the defensive half. Foul by Ryan Lowe (Bury). Attempt missed. Danny Mayor (Bury) right footed shot from outside the box misses to the right. Corner, Bury. Conceded by Jamal Campbell-Ryce. Corner, Sheffield United. Conceded by Andrew Tutte. Corner, Bury. Conceded by George Long. Attempt saved. Peter Clarke (Bury) header from the centre of the box is saved in the top right corner. Corner, Bury. Conceded by Jose Baxter. Substitution, Sheffield United. Ryan Flynn replaces Louis Reed. Attempt saved. Danny Mayor (Bury) right footed shot from outside the box is saved in the centre of the goal. Chris Basham (Sheffield United) wins a free kick on the right wing. Attempt blocked. Billy Sharp (Sheffield United) right footed shot from the centre of the box is blocked. Second Half begins Bury 1, Sheffield United 0. Substitution, Sheffield United. Billy Sharp replaces Dominic Calvert-Lewin. First Half ends, Bury 1, Sheffield United 0.